was first reported in the United States over 100 years ago and the first case in cats was in the 1920’s. Since then it has become a worldwide problem and has spread extensively throughout the USA and in specific areas in Canada: Okanoga Valley in BC, around Winnipeg and Montreal and throughout Southern Ontario (the biggest area in Canada). In May, we open up awareness specifically now, because the ‘heartworm season’ begins in June and lasts to approximately mid-October in Ontario. You can find out more about Heartworm disease in multiple areas in the Pet Care section of this website. Basically our policy is a bit different than the current general guidelines in Ontario. We believe that as long as you test 2 years in a row we are sure, to a very high degree, your pet does not have heartworm. We can begin preventative medication after the first test is negative and we retreat with the chosen preventative monthly every year from June or July to mid-October or November (longer if you’re also trying to prevent fleas). We do not retest unless you have forgotten to treat one year or have missed key months. Throughout March, April & May we remind, and educate, clients about heartworm disease. We retrain our staff to get them ready for the season, so that they are competent about the various kinds of preventatives that are available, and knowledgeable to answer your questions. We also begin testing or retesting patients to make sure they are free of this damaging parasite that causes congestive heart failure and pulmonary disease due to parasites lodged in arteries. Dogs are vastly the only ones affected in Canada, but there was one reported cat affected in Ottawa. 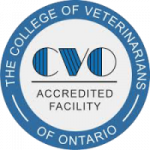 For more information on Heartworm, Lyme and Leptospirosis disease in Ontario use the link below.